There are now two women in the 2016 presidential race, and they couldn't be more different. Former Hewlett-Packard CEO Carly Fiorina announced her candidacy for president on Good Morning America Monday, and the Republican businesswoman included a few jabs at her Democratic opponent. Fiorina didn't wait long before throwing a few punches and this is far the first time she's spoken out about her disapproval of Clinton. Fiorina has criticized Clinton on everything from foreign donations to the Clinton Foundation to how she's running her campaign. 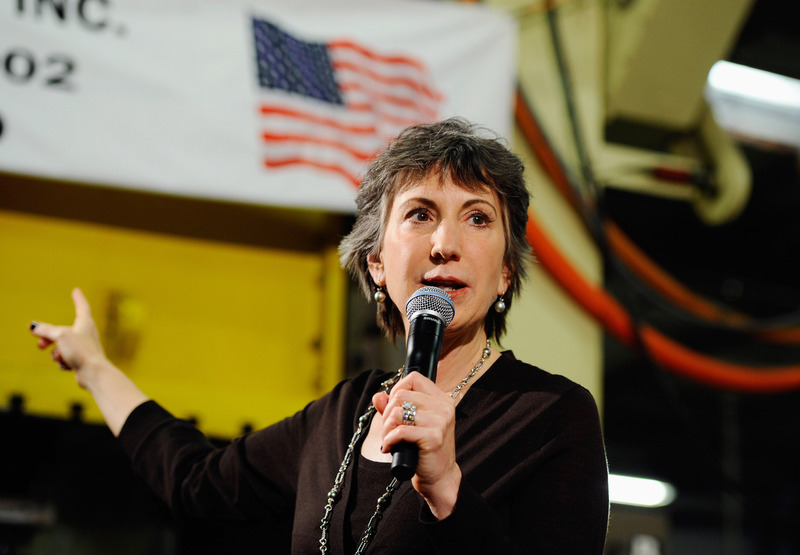 As the first female GOP candidate in the 2016 election, Fiorina clearly wants to set herself apart from Clinton. At the Conservative Political Action Conference (CPAC) in February, Fiorina told ABC News: "I think it’s totally fair game to call out the presumptive Democratic nominee on her track record and policies. Politics is about contrast, and I think as a conservative, we need to offer a very clear contrast to Hillary Clinton." Which is a fair point. The former CEO told Good Morning America that she's running for president because she believes she is "the best person for the job" and explained why Clinton is not. Here's a look at everything Fiorina has said about Clinton. At CPAC in February, Fiorina's speech attacked Clinton on many fronts. In regards to her leadership skills, Fiorina said: "She tweets about women’s rights in this country and takes money from governments that deny women the most basic human rights. She tweets about equal pay for women but won’t answer basic questions about her own offices’ pay standards — and neither will our president. Hillary likes hashtags. But she doesn’t know what leadership means." Fiorina even criticized Clinton's originality at CPAC, accusing Clinton of copying her book cover and slogan. When asked about Clinton's use of the phrase "unlocking potential" (the name of Fiorina's Super PAC is the Unlocking Potential Project), Fiorina implied that Clinton has copied her on more than one occasion. She said: "Her book cover was remarkably similar to mine, as well. Imitation may be the sincerest form of flattery, but I could steal one of her lines and ask, ‘What difference does it make?,'" alluding to Clinton's comments during an investigation into the 2011 Benghazi attacks. Fiorina also doesn't approve of Clinton basing her campaign on women's issues and gender equality. During a speech at a New Hampshire House Business Caucus Luncheon in April, Fiorina said: "Hillary Clinton desperately wants to run a campaign on being the first woman president. She desperately wants to run a campaign on the war on women. And I think Hillary Clinton should have to run her campaign on her own track record, or lack thereof." On Good Morning America Monday, Fiorina explained why she doesn't trust Clinton, with foreign donations to the Clinton Foundation being a major factor. She said: "She clearly is not trustworthy, about a whole set of things. She peddled a fiction about [Benghazi, Libya] for a month, she hasn't been transparent about her server and her emails, and now we see now all of these foreign government donations to the Clinton Global Initiative." While in New Hampshire last month, Fiorina subtly attacked Bill Clinton in an attempt to refute a sexist comment about having a female president. Fiorina said: "Ten days ago now, while I was in New Hampshire... I got asked by a reporter... whether a woman’s hormones prevented her from serving in the Oval Office. Can anyone here think of a single example where a man’s hormones might have clouded his judgment — including in the Oval Office? I know you laugh, but you know it’s true. There are loads of examples." At CPAC, Fiorina tried to downplay Clinton's experience as Secretary of State, saying: "Like Mrs. Clinton, I too have traveled the globe. Unlike Mrs. Clinton, I know that flying is an activity, not an accomplishment."